Auto Seal Inspection & Gaging System | Cincinnati Automation Ltd.
Keyence high speed 2MP camera mounted above an LED backlight conveyor programmed to verify correct length and diameter of automotive tube seals at a rate of up to 5pps. 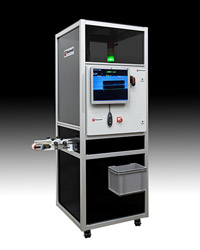 The inspection system was also programmed to detect short shots and flash that can occur during the molding process. Pass and fail results were summarized on the LCD display. The compact inspection cabinet only took up 4 square feet of floor space and included internal reject containment, good parts chute to bin/box and casters for portability.